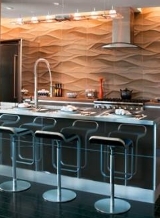 Tantalizing Tile Patterns...A Symphony of Shapes & Styles! A Symphony of Shapes & Styles! The striking tile patterns featured here vary in scope from simply stacked pebbles to intricate marble and glass mosaics. Regardless of style or degree of complexity, each has a rhythmic symmetry that brings harmony and balance to the surface it showcases . . . . . as well as the room it graces! 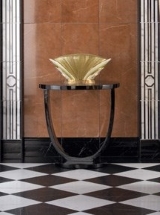 Few present-day examples encompass the variety and volume of shapes and con- figurations employed in the floor tile design that follows. A collage of circles, triangles, rectangles and squares, this exuberant mosaic tile pattern is composed of a series of individually patterned "sections." When joined together, like the instrumental sections of an orchestra (i.e., strings, wood- winds, brass, percussion, etc. ), they form a harmonious whole. 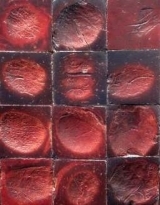 Tile patterns are as varied and abundant as our collective imaginations. 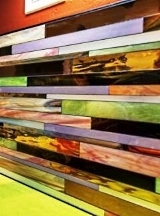 Whether for a kitchen backsplash, a fireplace surround or a bathroom floor, the range of options is virtually limitless. 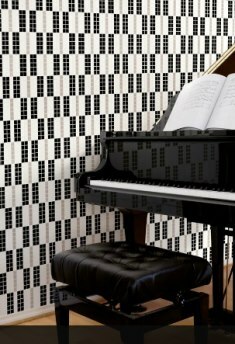 A rhythmic keyboard pattern scales the wall in a glass mosaic tile design by Andree Putman for Bisazza (below right). The "Chez Monet" collection from Country Floors brings old world charm to a new world kitchen. 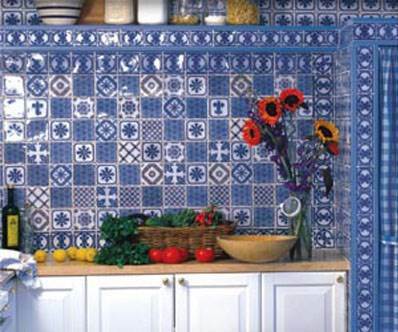 Inspired by famed French Impressionist Claude Monet's farmhouse kitchen in Giverny, the square blue and white tiles feature geometric patterns derived from 18th century design motifs. Laid end to end with joints that alternate between adjacent rows, the running bond ceramic tile pattern continues to be popular. 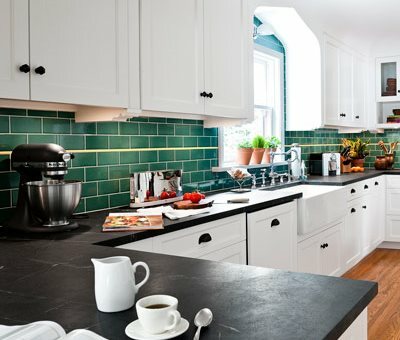 Rectangular kitchen backsplash tiles from Mission Tile West are infused with rich tones of green that contrast beautifully with the all-white millwork and cabinetry. Getting Round to It . . .
Swerves and curves join short segments of right angles in a rythmic tile design from Artistic Tile's "Vetromarmi" collection. 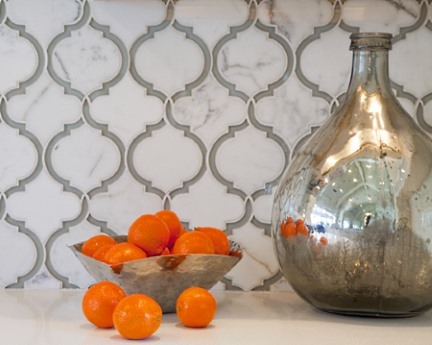 The Moorish-inspired design combines stone and glass in a water jet mosaic. Pictured below is their "Toledo Lucido" pattern. 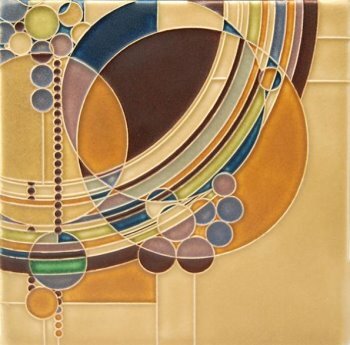 A kaleidoscope of color permeates a succession of circles in this striking 8 x 8 inch tile from Motawi's "Frank Lloyd Wright Collection." 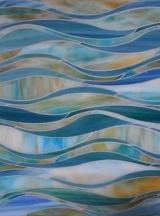 Pictured here in oak, "March Balloons" makes a stunning focal point in a kitchen backsplash tile design. Stacked pebble tiles from Island Stone lend a distinctive look to a contemporary shower tile design (below left). The striking contrasts in texture, shape, size and color are achieved by alternating wide bands of large square porcelain tiles with narrow bands of dark pebbles, shown here in charcoal. 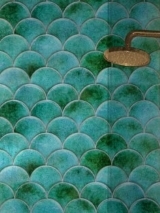 A bathroom backsplash bursts into bloom in a design from Artistic Tile's Jazz Glass Collection (below right). 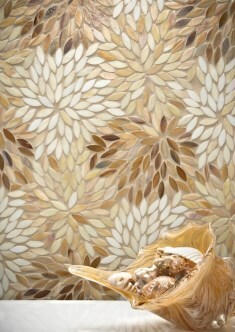 "Estrella" features a striking floral-inspired pattern in a handcrafted glass mosaic, shown here in cream. 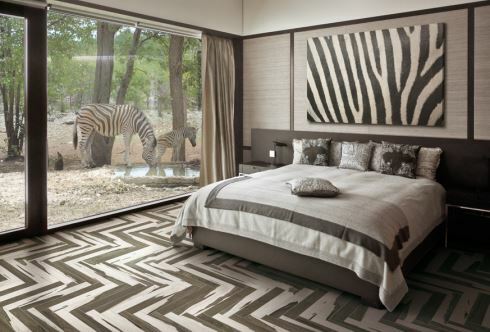 Italian tile producer Cerdomus infuses the formal elegance of a herringbone floor tile pattern with the untamed natural beauty of the African savanna. 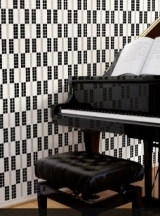 Pictured here in black and white, the "Over" series features glazed porcelain tiles with an exotic flair. 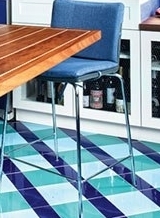 Please check back often or subscribe to our RSS feed, as we frequently add new tile design ideas to our site. 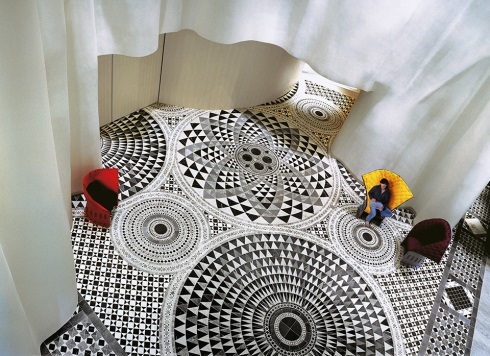 Standout Tile Designs...Imaginative Wall & Floor Tile Ideas! 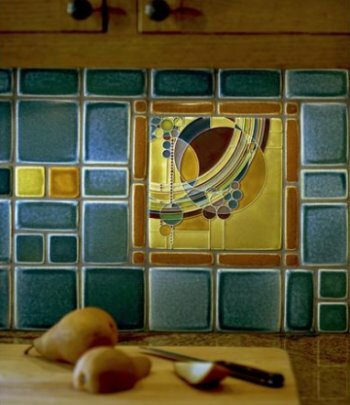 Imaginative tile designs for your bathroom, kitchen and patio! 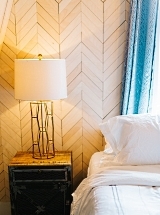 Upcycled and reclaimed wood tile from Everitt & Schilling are a designer's dream for creating unique spaces! 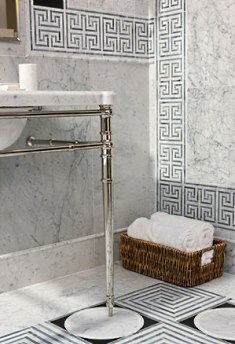 Small Bathroom Design...Big Tile Style! 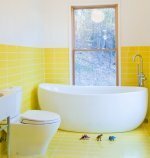 Small bathroom design ideas with tile impart panache and style!